Just bitten and the pit, well it's non-existent. And the smell, it's as if someone was dangling a peach right in front of your face. Soft, succulent and juicy -- the way a peach ought to be. 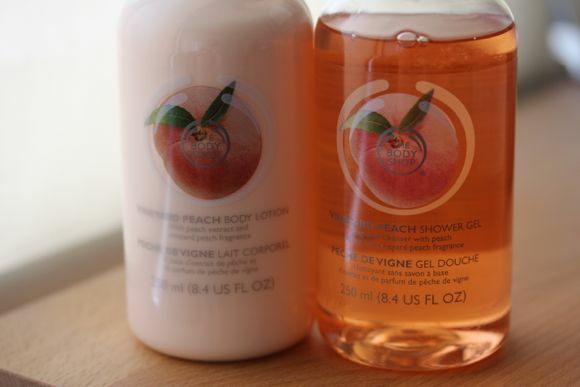 My life's been quite peachy with a little help from the Body Shop. Truth be told, three of the four items have been lifesavers after being rotated into my morning routine two weeks ago. The Shower Gel provides a burst of sunshine in my porcelain cream bathroom; my senses are perked up so much that I've considered skipping my morning dose of coffee. You read that right, considered. After drying myself off, I then smooth on a bit of the Body Lotion onto my arms and legs. During the day I sometimes take a whiff of my forearm in order to get a soft hit of peach. Weird, but it works and don't knock it 'til you've tried it. 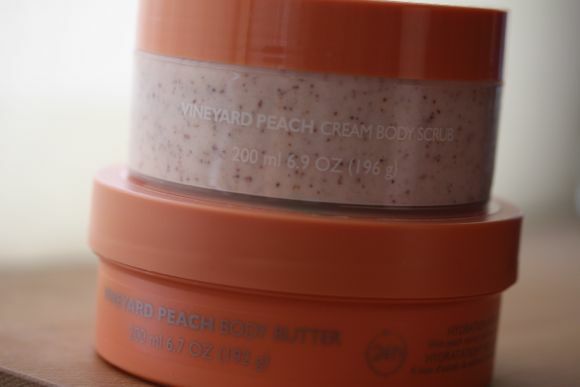 The Vineyard Peach Cream Body Scrub is something I've only used once prior to a day at the beach. The creamy consistency helps to spread the product around and the little scubbers work to slough away dead skin. I really can't comment on the Body Butter, except for the smell (it's just as delicious as the rest of the collection). Personally, I prefer using a lighter lotion, because I don't want to feel like I'm the one who's being worn -- I've always felt this way about heavier lotions. Although, now that I think about it, I might change my tune when the drier, cooler seasons roll around. Like what you've seen here? Get to your local Body Shop and pick up Vineyard Peach. Btw, this is a limited collection, so start running! Shower Gel - $12.95 AUS / $8.00 USD - it's cheap and my favourite by far.